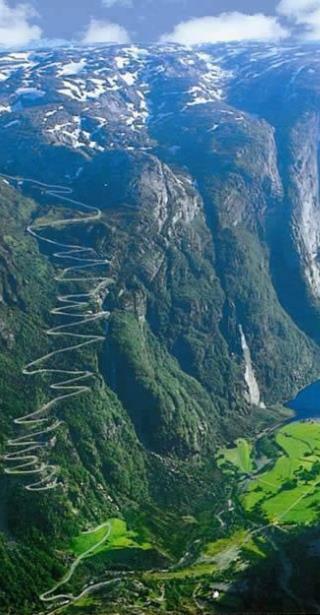 Lysevegn Road, Norway | Drive This Classic Route, Adventure Awaits! This famous mountain road starts in Lyseboten in Norway and is a fairly steep route that consists of 27 hairpin turns along a narrow road. The road certainly required your full attention and concentration as a driver but the views are well worth stopping to enjoy. While the road is only 29km in length, the drive can take a fair amount of time since you will probably wish to stop along the way and you will obviously need to take it slow. Whether you are booking your rental car and accommodation in Lysebotn or you are just passing though, it’s certainly worth your while to spend a day or two in this scenic part of Norway. The drive itself is the main attraction in this area. At the top, not only will you be able to take in the amazing view but you will also be able to park and enjoy meal or light snack. In the village of Lysebotn, many tourists and locals enjoy adrenaline pumping activities like base jumping. If you wish to reach Lysebotn from Skagenkaien, Lauvvik or Forsand, then you can also choose between relaxed cruises and express boat trips that will take you beneath the famous Preikestolen. Preikestolen (the Preacher’s Pulpit) is a 604 metre high cliff face and is visited by thousands of tourists each year. The road, as previously mentioned, is a narrow one. When driving along the Lysevegen road, do take care and take it slow. There are also many portions of the road that are not fitted with guard rails. If you or any of your passengers suffer from any form of motion sickness, it would be advisable for you to take the necessary preventative measures before you embark on this winding journey. It is also important to note that this route is only open during the summer months. In the winter, due to snow, ice and other dangerous conditions, the road is closed. When planning your drive up, try to make your way up when visibility is good. The fog tends to roll in from time to time and, while it might not completely engulf the road, it will make the view somewhat less spectacular. When setting out on this drive, it is very important to be prepared with all the supplies that might come in handy including a change of clothes and shoes suitable for hiking. If you don’t wish to enjoy a meal at the food local facilities, then make sure that you pack a suitable lunch. Due to the amount of concentration required by drivers, you may wish to book your accommodation in the local village below. That way, you won’t have to drive far in order to get back to your hotel for a rest and access to stores, more restaurants and other facilities afterwards.